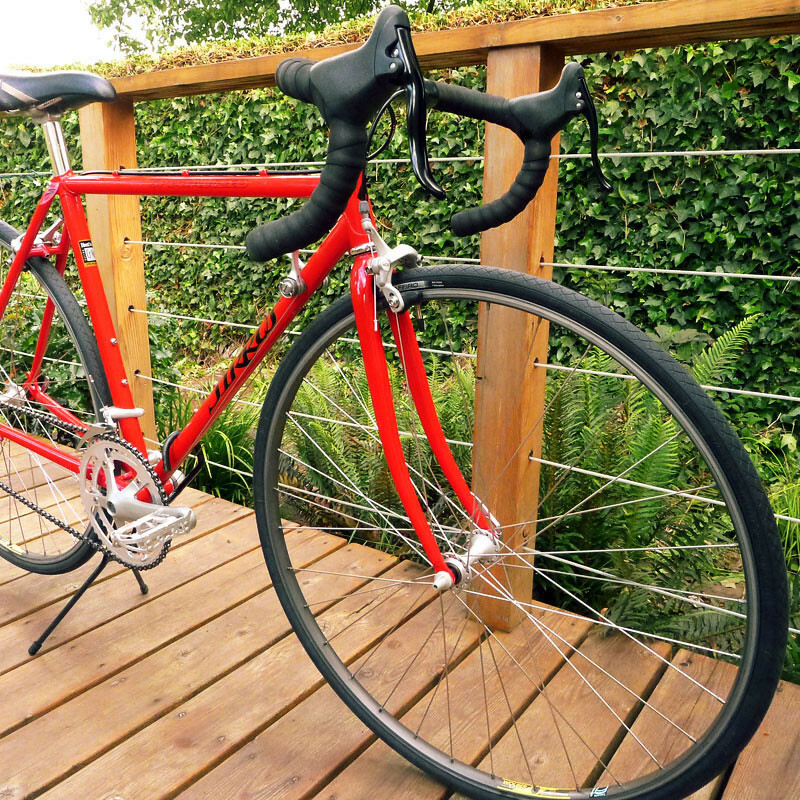 Specialized made some exceptional steel road bikes in the 80’s and 90’s. 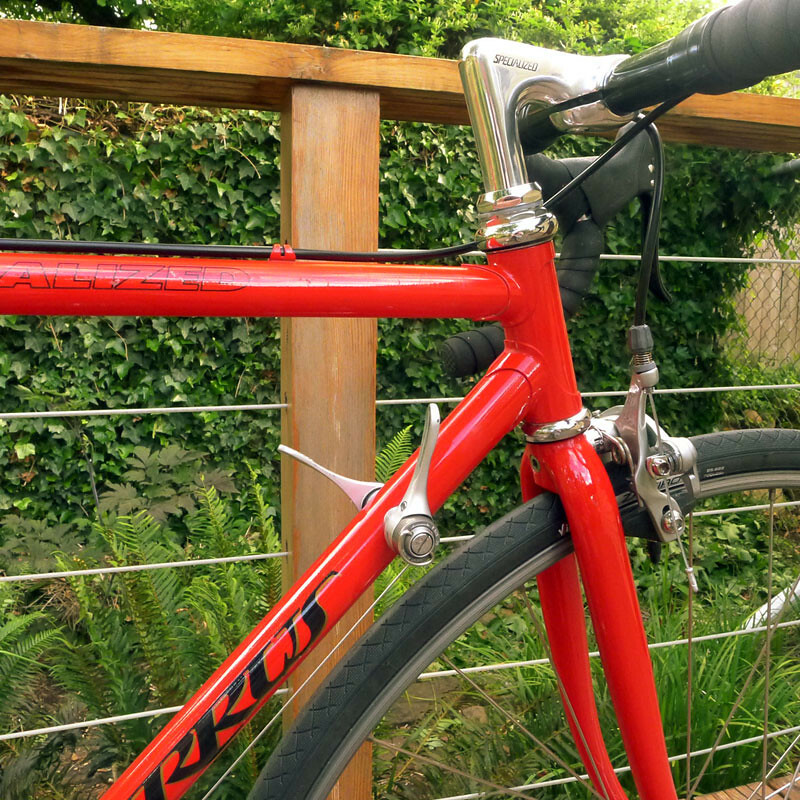 Although, most only consider the Allez when they think of these (typically) Ferrari red steeds. Next in the hierarchal lineup is the Sirrus and sadly, it does not get the respect it deserves with its big brother, the Allez, constantly hoarding the spotlight. 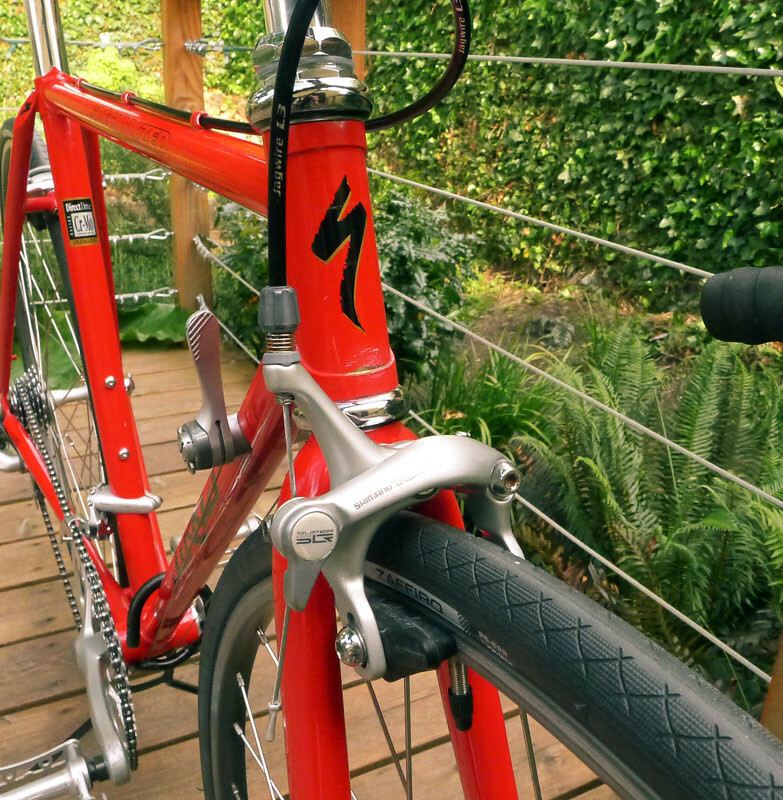 With exception to the Allez models crafted by master Japanese frame builder Yoshi Konno (3Rensho), the Sirrus was extremely similar to the Allez, although typically considered more “sport” oriented as opposed to the Allez’s “race” title. 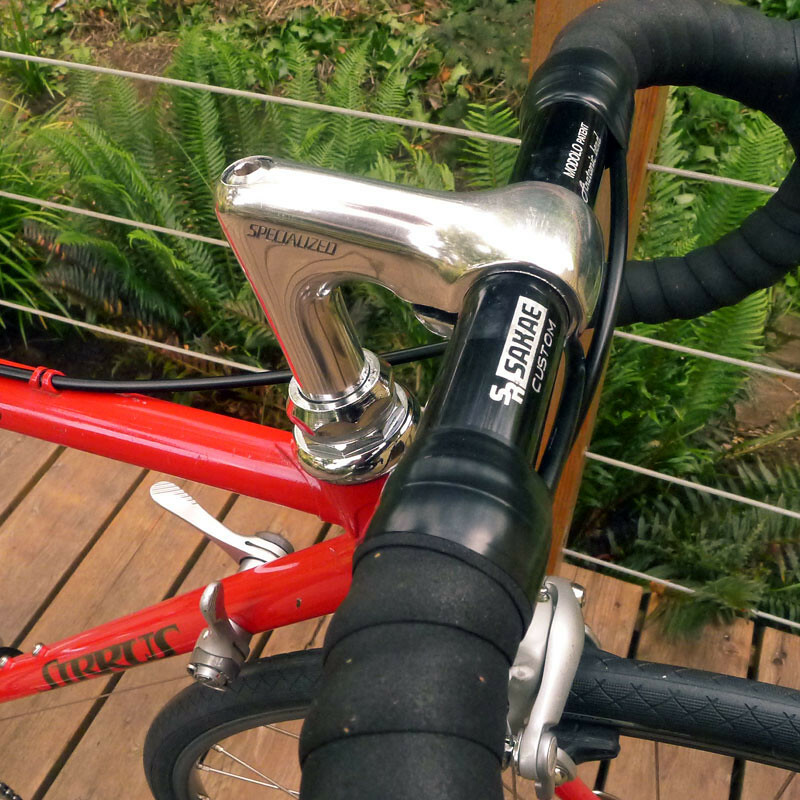 However, from 1987-90, the Specialized’s Allez and Sirrus were equal competitors with identical tubing and geometry—the main difference only being the components. These golden years for the Sirrus are very desirable as they were built with classically styled lugged steel frames and fantastic workmanship. Of course, the race inspired geometry, materials and components were also impressive as well. The Sirrus shown below was a diamond in the rough as it came to me well used from the original owner who rode it hard for semi-professional triathlons. Overall this steed was in great shape but was extremely filthy and needed a little extra care and time to uncover its glorious luster. I discovered that although the paint on this frame is gorgeous and oozes cycling sexiness, it was extremely fragile compared to other bikes I have worked on in the past. Bringing the Sirrus back to stock with the components it already possessed was not too difficult although some upgrades and alterations needed to be made. 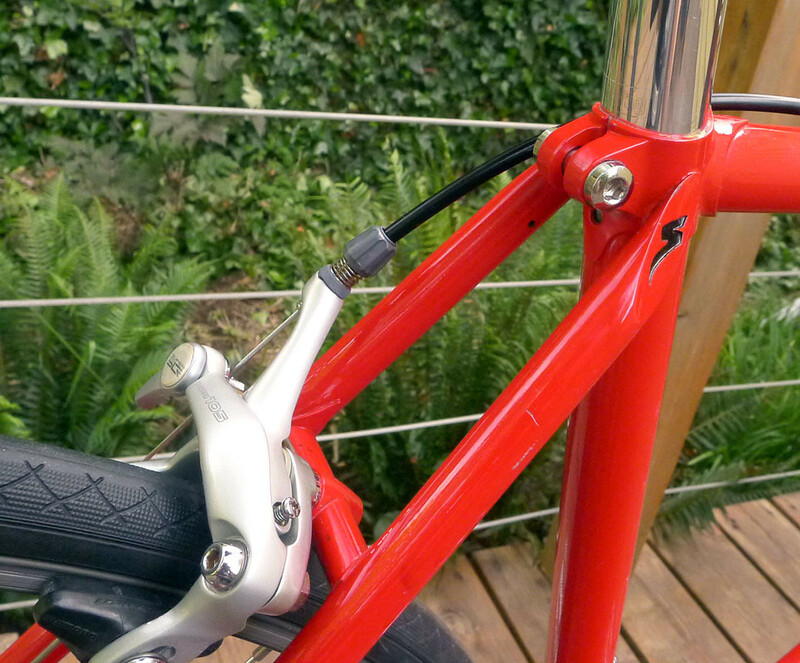 The stem that came on the Sirrus is branded by Specialized and a perfect mate for the high gloss red frame. However, over time, it had become quite abused. Since the stem was such a nice pairing, I did not want to see it separated from the frame, so I decided to strip the black anodized paint off and expose its mirror-like chrome finish. I felt as though this would tie in nicely with the chrome headset. I also did the same treatment to the seat post. The scuffed and weathered silver anodizing was removed, exposing a gorgeous chrome finish. I personally like that the top portion of the bike is chrome and the bottom half stays muted in Shimano’s silver anodized luster. Both seem to compliment one another well and don’t stand out badly or take away from each others aesthetics. 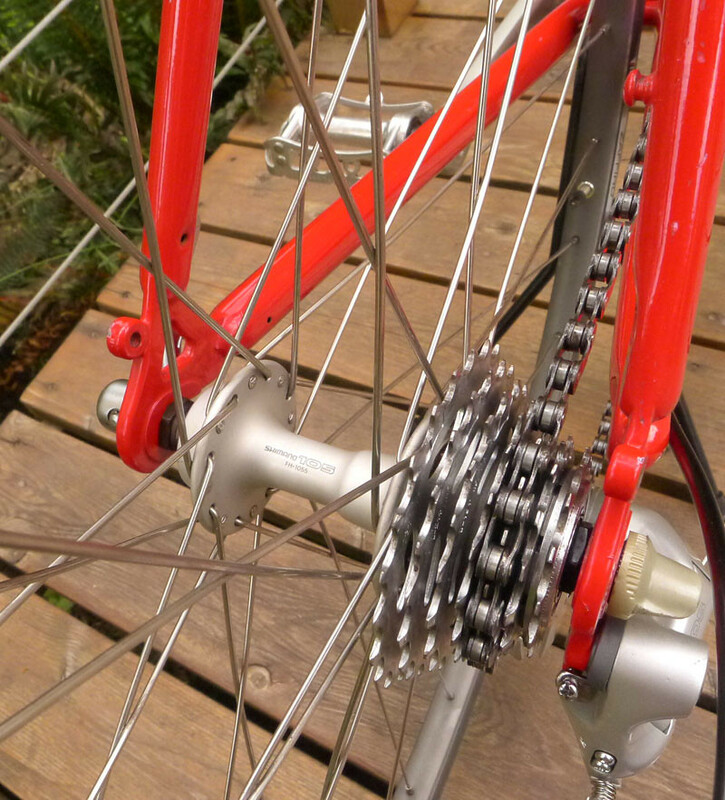 The Sirrus was equipped with a full Shimano 105 groupset, which I kept in tact except for the brake levers. The levers were so abused with massive amounts of medical tape (remember, used by a triathlete) and rough use that I removed the grungy balls of stickiness and replaced them with the stellar, all black TEKTRO R200’s. These seem to work for the Sirrus in more ways than one and give it a more aggressive stance by blacking out the drop bar area. Other than the above mentioned alterations, other edits were mainly consumable items such as installing a new, sealed Shimano bottom bracket, new rubber (Vittoria Zaffiro’s), new cables, housing, grease and bar tape. This is the “standard package” my bikes get once they are torn down and built back up again. The only fine detail that keeps eating at me is that the dustcaps for the cranks were so old, brittle and discolored, they were not in any shape to be reused and I am not having luck finding replacements. Ah well. Nightmares of a perfectionist, I suppose. Josh, I’ll check my boxes. I just might have a pair of those dust covers. That would be great, Mark, thanks! Beautiful Bike!! The one thing that I do not care for is the uni-crown fork. The earlier models had a investment cast steel one with a nice lugged crown. I actually like a crowned fork better! Very nice bike indeed. I just got the same bike from my brother in law who wanted to throw it away. It is still looking great after a simple first clean with wd40. Here in Holland these american bikes are rare. Vintage bikes here are mostly french, italian or dutch so i’m pleased to read your story about this bike. Thanks! Wait a second. Did I hear you right? “Throw it away”? It amazes me what some consider junk. But what seems really odd are the other points you make such as how American bikes in your area of the world are rare. 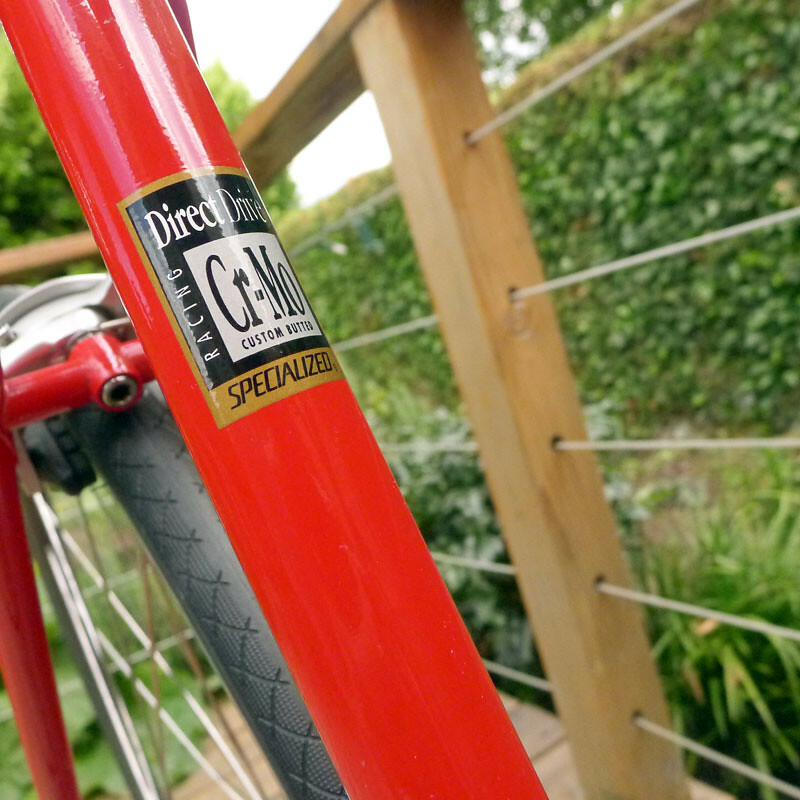 Also, the Sirrus was, at one point, an expensive bicycle and even today, it still looks the part. I like to think that low end bikes and higher end bikes have a certain look and feel that even those with little knowledge of bicycle value can tell apart somewhat. At least to a certain degree. So, unless your Sirrus had the painted melted off because of a fire, I can’t imagine someone simply wanting to pitch it. Either way, I tip my hat to you! Nice save and even better score. Let’s not also gloss over the fact that you got it for the best price possible… Free! Of course, the elbow grease you put into the clean up brings you through the right of passage that solidifies it, wholly, as your own. Thanks for sharing your story and enjoy your Sirrus! Nowadays american bikes are not rare here in the netherlands. Specialized is a well known brand. 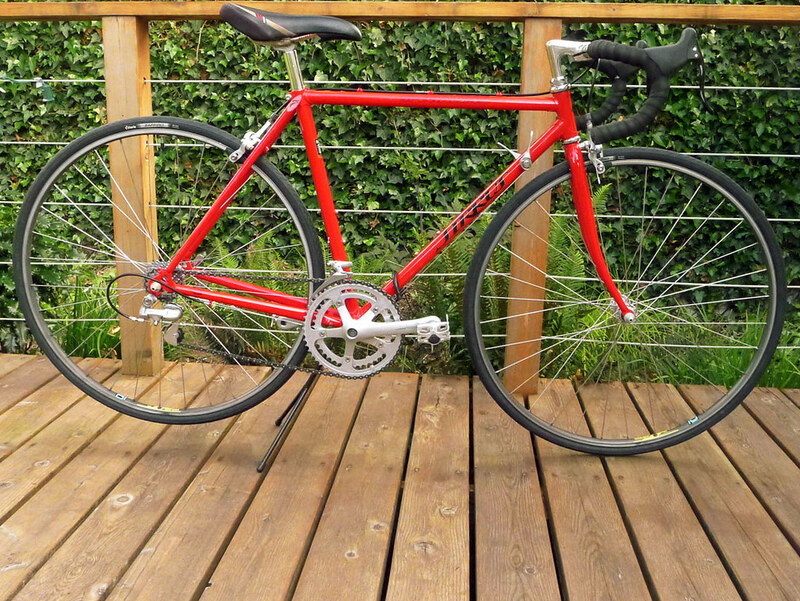 But an american road bike from 1990 is rare. Not strange if consider the great european bike history. And yes, i don’t understand why he did not see the quality of this bike. For me all the signs were there. But for some…they will never see it. At least he remembered that i liked the bike very much when i saw it hanging in his shed once. Josh, by the way: how did you get that stem so shiny? Lots and lots and lots of polishing… by hand. I just sold the bike to the original bike store. They used to be the importer (?) for Specialized bikes for the Netherlands. The owner wants to donate it to a Specialized Museum thats being set up. So, the special quality of this bike is still apreciated. It is great to hear that there is a place which preserves and showcases these older, steel framed gems. Now, if only it gets taken out and ridden every now and again, life for it would be perfect! Josh – a great looking bike! I have a green/white Sirrus from the first year 105 came out with index shifting – it has the crowned lugged fork and the ‘biopace’ gear ring believe it or not. Still a great looking/ riding bike! Got 2 compliments on it while out riding tonight ha ha. It’s always satisfying to hear of others out there still keeping the vintage steel alive and well. I have seen other Sirrus bicycles in the past but not a green model. I’m sure a quick image search would yield fast results but I would rather opt to see if you have any shots of yours? Checking out other readers rides is a special treat for me. Indeed, for almost twenty years and over several moves, it only saw very limited use for commuting and then not much at all for a while. However, I’m now living in the Netherlands and riding it regularly and over long distances, inspired (perhaps scared?) by a doctor telling me last year that I needed to lose weight and improve my cardio-vascular fitness. I still enjoy the ride the bike gives, but as I’ve been increasing my fitness and time spent on the bike (currently around 300km per week), I’ve become increasingly aware that it’s not a particularly good fit to my body and niggles are creeping in. Also, of course, even though I know that it’s thought of as a bit of a classic, the technology onboard is 25 years old, and thus I’ve been thinking hard about (finally) getting up-to-date and buying a new road bike, perhaps carbon, or even one of the lovely looking Dutch Van Nicholas titanium bikes. Which leaves me with the question of what to do with the Sirrus. I could take it in somewhere to be stripped down, cleaned, key parts renewed, and perhaps have a new shorter stem fitted to better fit my geometry. But if I’m going to buy a new bike, I’m not sure the Sirrus would see that much future service (I’m not likely to become a collector or multiple bike rider [although I have a separate commuter bike which carries panniers etc. ]), so would that be worth the time and money? Or I could perhaps sell it for someone else to work on and enjoy; from this article, it seems as though there might be a bit of a market for a classic US steel-framed bike like this here in the Netherlands. Could also help defray the costs of a new bike. Perhaps I should contact the bike shop / former Specialized importer mentioned by Kathaai (could you send me the details?). Great job! Today I got a Sirrus myself from a very nice person who used to ride it himself several years ago. Curiosity made me look around what others have done with it. I found that the STI levers don’t shift, so I went ahead and unmounted everything in order to give each parte the deserved maintenance. I shook the frame and got quote a few rust flakes out. Is CR-MO prone to rust? Should I be worried? Is there anything I can do against the frame rusting from the inside? From the outside, It looks well in most places, except for the “pipe coupling” (don’t know if that’s the right term) near the bottom bracket, where some rust is visible through the finish. I am pleased to hear of yet another Specialized saved from the dangers of time and neglect being rehabilitated and closer toward acceptable riding condition. Cheers to you! As for the rust questions, CR-MO is steel and as such, it is prone to rust when it is exposed to certain conditions. Damp climates, sweat that hits the frame and is not wiped off, or any number of other elements can cause oxidation. Luckily, so long as it hasn’t eaten through entirely, your Sirrus steel tubing likely still has all of its structural integrity. To combat the problems you describe above, I suggest beginning by stripping down the frame, mounting it on a repair stand and washing it with warm soapy water (sometimes a heavier degreaser is necessary to remove more stubborn stuck on material), rinsing it thoroughly inside and out then, if you have access, use an air compressor to remove all remaining water. Then bring the frame out into the sun. Once dried, I would recommend getting some brass wool and trying to polish off the external rust spots. The brass is very soft on the metal and typically won’t damage paint but test it in an inconspicuous area first. After, consider using a very fine paintbrush, or other paint detailer item, to dab a small amount of clear coat onto the frame. Clear coat in a bottle can usually be found at any hobby store that sells models. Rust on the inside of the frame can be “scrubbed” away with brass brushes or other similar, small brushes. 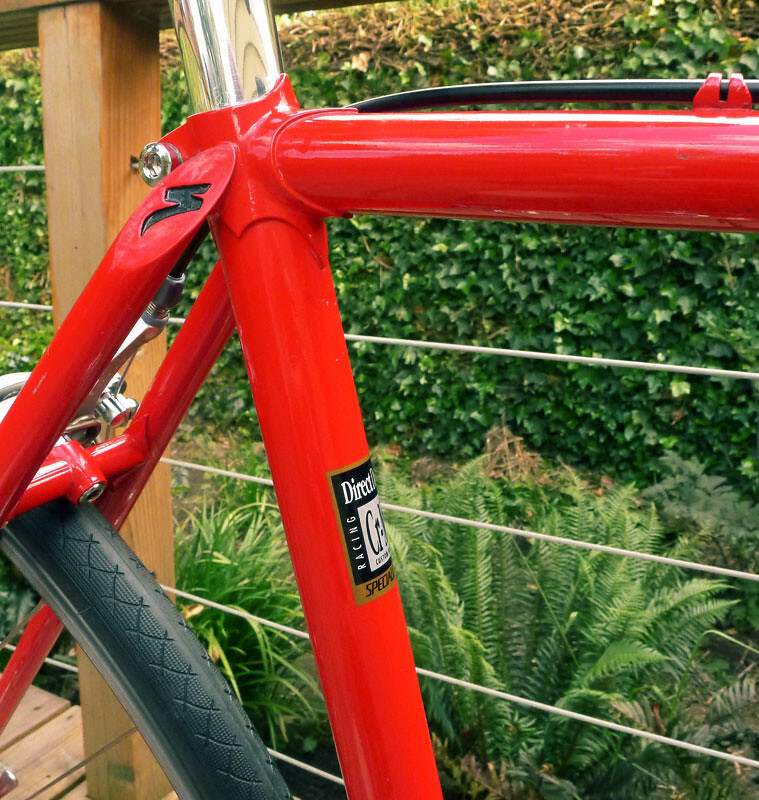 Once the rust is removed from the inside of the frame, consider investing in a can of JP Weigles Bicycle Frame Saver. Instructions on how to use the aerosol are easily found throughout the internet and likely on the back of the can. Those steps together should completely inhibit your rust issues and the frame should then be ready to being building back up. To squelch cancerous rust correctly takes a bit more investment of time and funds but in the end, your Sirrus will be extremely protected from reoccurring oxidation and the odds of you having to ever do this again will likely be reduced to a very small percentage. Thanks for the detailed advice! What a great and informative post. 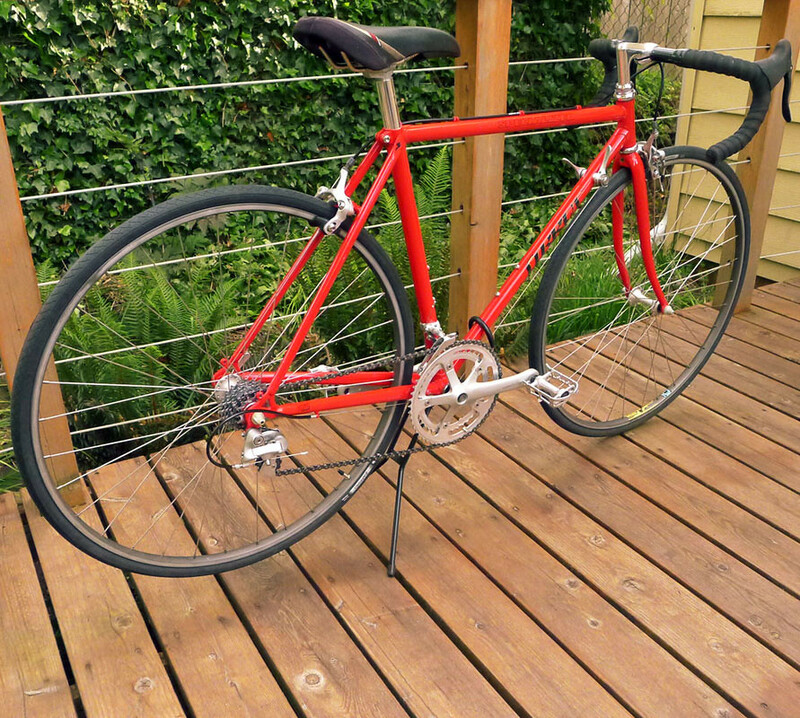 I recently “inherited” a 1990 Sirrus from a co-worker and I’m in the process of cleaning and fine tuning the bicycle. This will be my first time to undertake such project and I have a few questions which I think you have the answers to: Which cleaner to use to remove dried-up adhesives? What solvent did you use to strip the paint on the bar stem? Any suggestions how to restore luster to parts which show oxidation? Your Sirrus, as you can see, will clean up to be a very fine bicycle. In fact, when I received mine, it was owned by a female triathlete who rode it hard and put it away wet. It was a mess but it wasn’t abused, just filthy (as mentioned in the post). In fact, I pulled out all the stops to clean it including addressing all your questions along with a slew of other small tricks of the trade you may not even notice in the images. For removing adhesives, I use Goo-Gone. Many times I will need to reapply it over and over but eventually, it works its enchantment on said residue. Magic Erasers also work wonders. For stripping the paint on the stem and restoring luster, what I used was multiple grades of wet sandpaper, Mothers Aluminum polish and a whole lot of time. The last item is what most people have the most difficultly in bringing to a project. I’m lucky I have patience or this craft would not be as rewarding. In fact, to bring it into perspective, I spent nearly all of my most recent weekend polishing a Stronglight crankset (including chainrings) for a project. I can’t say that it’s a fun time sanding away your weekend but the time in prep are what pays dividends in the polishing. There really aren’t that many secrets other than time, patience and elbow grease but there are some other items that will make your project go smoother. In fact, I would highly suggest you read all 5 pages of this thread that has been created and updated over the years by a Classic and Vintage bicycle BikeForums.net member. It may take you a little time to get through it all but I can assure you it will make your path on restoring luster and removing anodizing and paint more straightforward. Sorry for the late reply. The Sirrus I’m working on is beginning to “come alive” thanks to your suggestions. I’ve taken it for a test ride and it is just a pleasure to experience the steel feel all over again. Just pulled my old Sirrus out of the basement and cleaned it up today. It is a similar frame with a slightly different 105 group and bio chain ring. 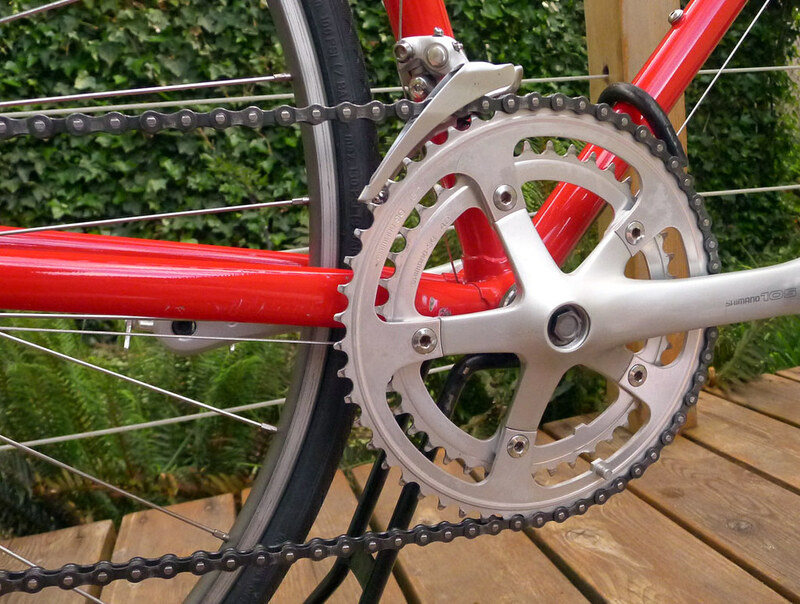 It has 52/42 chain rings and 6 speed freewheel and is red with green lettering. I’m guessing I bought it around 1987 and hadn’t ridden it in 10 years. The roads in Colorado Springs aren’t great for road biking and many of the trails are packed gravel so mtn and hybrid biking has held my attention. Unfortunately the chrome headset is pitted but otherwise the bike is in good condition. Had to clean and lube the headset bearings and replace tires/tubes. I’ll probably replace the brake pads for better stopping power. All original except seat and pedals. Rides just as I remember. Great ol bike! BTW Vintage road bikes were everywhere in Portland when I visited this summer. Couldn’t believe it when I saw an adult riding an original Schwinn Apple Crate. A memory from my childhood. Thank you for the note and confirming the claim of longevity and durability of these fine steel machines of yesteryear. Even though your area of the country may not be quite so accepting of a 50 mile road ride outside of town, your Sirrus is a capable bicycle with way more giddyup than you may remember. So, take her out every now and again to stretch both of your legs and to enjoy the push of speed that many other types of bikes cannot replicate. Even a short hop will do. You know, just to get the blood moving and the thrill of excitement pulsing through your veins. As for Portland, we do have an eclectic mix of bicycles in this city! I like to think of it as a good problem to have. The journey is long but isn’t the satisfaction worth the wait? I too have had multi-year searches conclude with victory and the feeling of the acquisition is tremendous. Now, take your time and build it up to your liking. That first pedal stroke will be nothing but bliss. Also, feel free to share pictures! Beautiful bike! Well done. 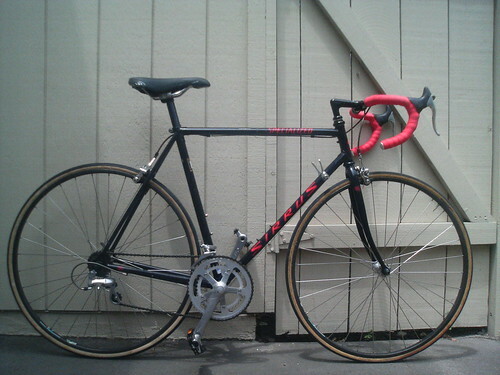 I have a 1992 Sirrus, dark blue with Suntour Edge components (Sakae triple crank and downtube indexed shifting). Love the bike but to me, if it’s a Specialized it really should be in that Ferrari red. Even though the bright, liquid red is fairly perfect for this model Sirrus, I’ve seen the blue model before (white lettering, right?) and I’d say that is a fine looking bicycle as well! Another iconic look I immediately conjure up when I think of the Sirrus is the dark gray/black model with red lettering. Enjoy your Sirrus as color certainly doesn’t matter while you are blasting down the road! Thanx for this article. 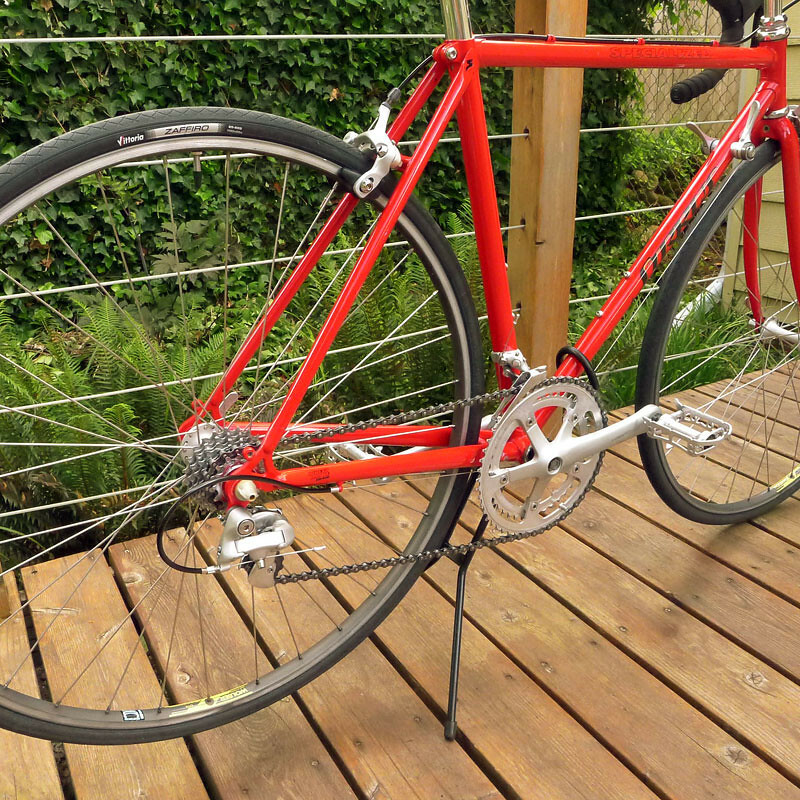 I have this bike, fully restored but I will be upgrading the brake calipers. I love this bike, it’s simplistic minimal design is rather lightweight comfortable and very clean. I like yours too, nice bike. I wish I could share an image of mine with you. It looks exactly the same. Accept my decals are yellow. Out of all that I have written up, the ’90 Sirrus write-up is strangely one of my most read posts according to my metrics. I’m not sure if it’s because of how plentiful they were, if they are great examples of “survivors” and people are just now finding them, if some other blog/website recently highlighted one which temporarily boosted popularity or if some other reason(s) has dictated it so. However, I can’t argue the sexiness of nearly all the Specialized line from touring to racing so I don’t mind that this thread’s comments continues to grow. Regarding your Sirrus, we can absolutely add an image! Is it hosted online? We can link to it. If you have a file of it, send it my way and I’ll add it to our thread. One way or another we’ll get your represented. Just drop me a line through the contact page. Took a walk with my dog Thanksgiving morning and found one of these laying in a backyard and took it home thanks for the inspiration.I love the stem work. 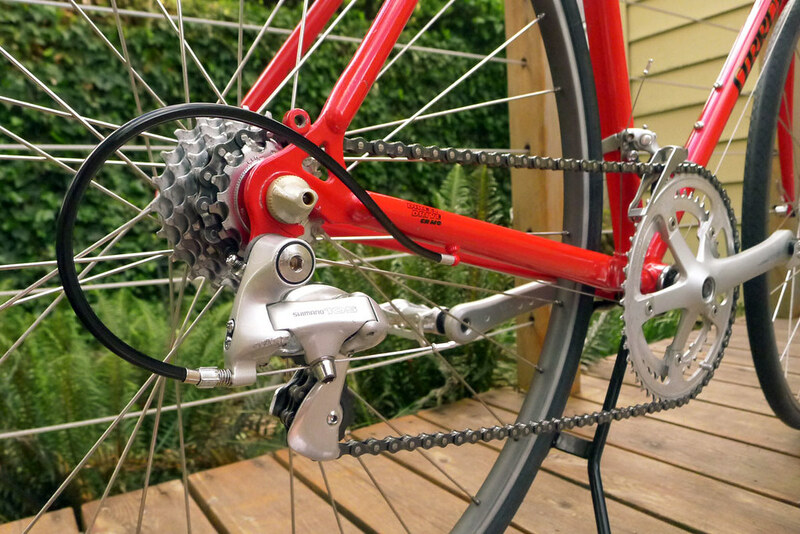 Everything was intact except the rear derailleur and the wheels looking forward to working on this bike.thank you. Great find! 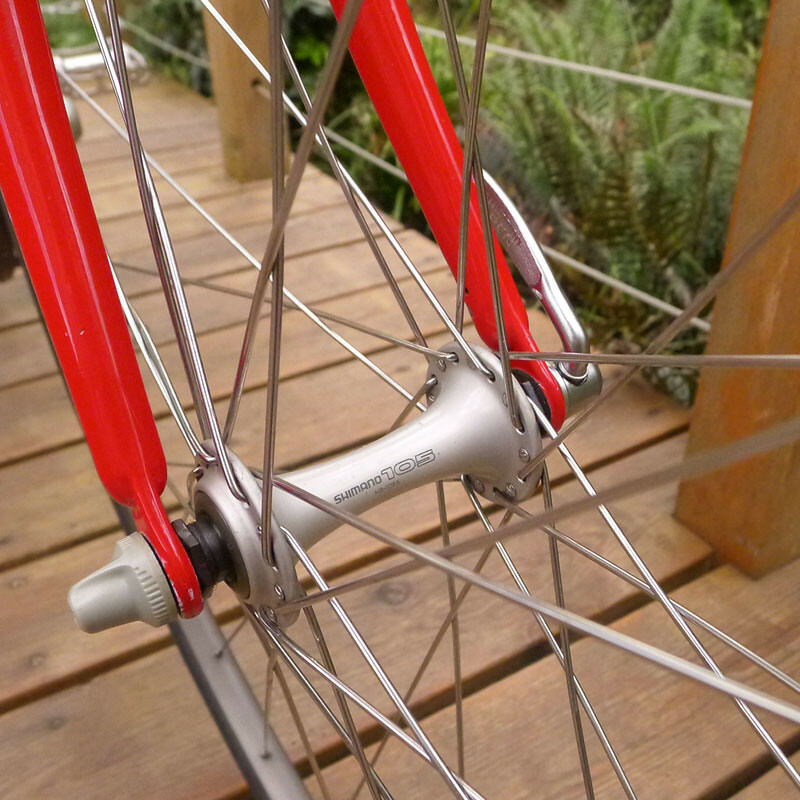 A rear derailleur and some wheels/tires are a small price to pay for an exceptional bicycle. Nice work! What size are those rubbers? They look like 28s to me, and i’d love to put a pair of those on my sirrus, but i don’t know if they fit. Can you please confirm the size? I am sorry to say that this bicycle has been sold quite a few years ago so checking the size of the tires isn’t possible. I also didn’t do as good of a job documenting details as I do now. However, using a few clues I am going to agree with you that I used Vittoria Zaffiro’s in 700x28c. I’d say that is likely about as large as possible for that type and year of frame but if you had some 700×30/32c’s around, why not start there and assume they won’t fit. If they do, your day will certainly be made! I know this is a old thread now, but I just stumbled upon it. I also own this exact bike. I bought it new in the summer of 1990 (I remember it being in Bicycling Magazine’s Best Buys edition that year) I turned 16 in the summer of 1990 and instead of saving for a car I bought this bike on layaway at my lbs with the money I made on my summer job. When I was finally able to take it, that first ride changed my life. I felt like the bike wanted to go fast and it felt amazing! I was immediately hooked on Specialized. I still have this bike, and it was my only bike until buying a 2009 Specialized Tarmac. I recently took a job in downtown Chicago and am planning on storing the Sirrus in my office for lunchtime excursions and keeping the Tarmac at home. I can’t tell you how happy it makes me to read replies like this, Ryan. A solid story, a great bike and a bright future. Thanks for sharing. This entry was posted on June 20, 2012 by Josh C. in Cycling Projects, Topics and tagged 3Rensho, CroMo, Shimano 105, Specialized Allez, Specialized Sirrus, TEKTRO R200, Vittoria Zaffiro, Yoshi Konno.